The prehistoric environment of northwestern Arabia remains largely unknown. 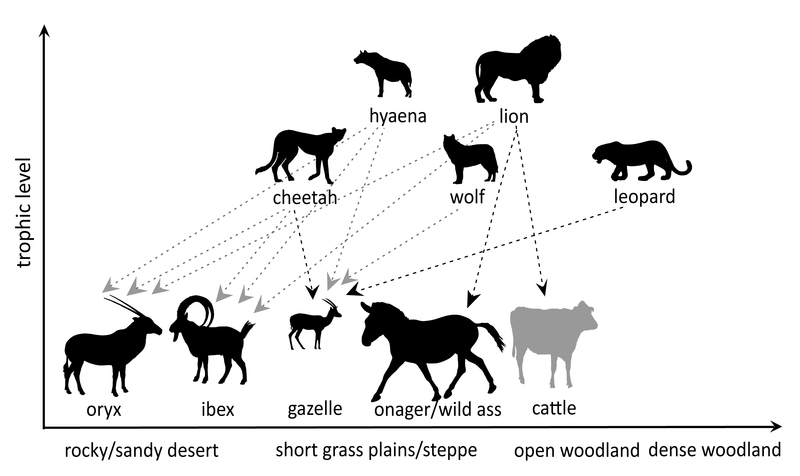 In this paper we use the animal species depicted in the rock art of Shuwaymis to reconstruct carnivore populations and prey biomass requirements. A typical pride of lions would have required over 38,000 kg of prey or approximately 166 onager to survive in the area, while a single leopard would have required a biomass equivalent to 72 mountain gazelles. The simultaneous presence of lion, leopard and cheetah also suggests a mosaic of habitats with thicker vegetation along the water courses of the wadis and more open vegetation in the landscape around them. 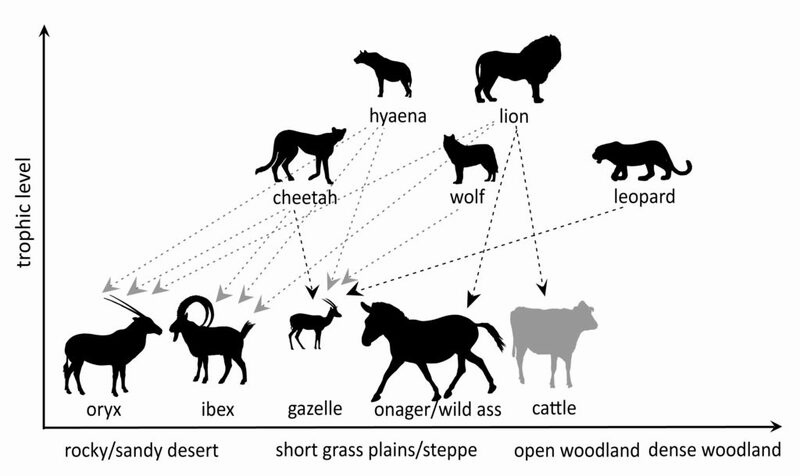 Moreover, the long-term persistence of large carnivores suggests that they were connected to larger metapopulations outside Shuwaymis, with corridors that allowed immigration and emigration of individuals. 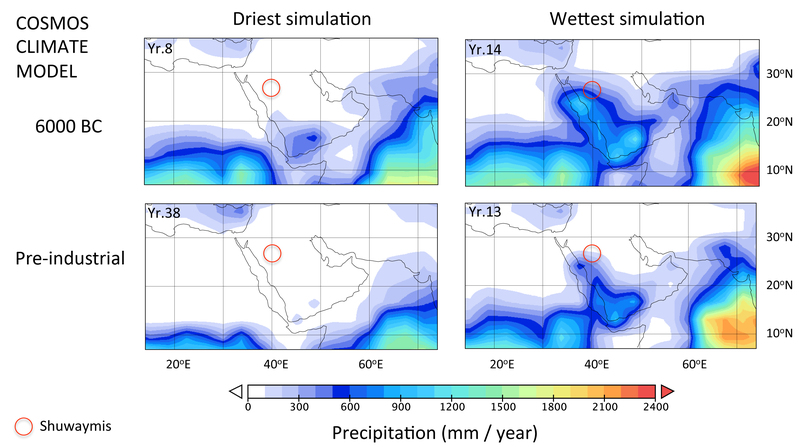 Community Earth System Models (COSMOS) climate simulations show that Shuwaymis was at the northern edge of the African Summer Monsoon rainfall regime during the Holocene humid phase. 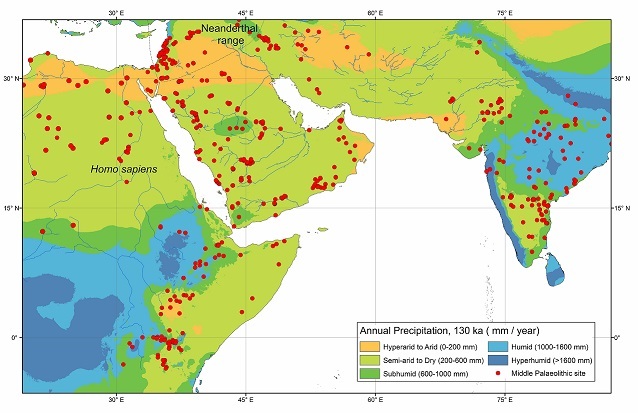 This suggests that Shuwaymis was ecologically connected with the southwest of the Arabian Peninsula and that large carnivores are likely to have found suitable habitats in the areas that were reached by the monsoon. Read more in Rock art imagery as a proxy for Holocene environmental change: A view from Shuwaymis, NW Saudi Arabia in The Holocene. Increasingly, 3D artefact models are being used as the foundation for analysing shape differences between handaxes, enabling a much greater understanding of variation in the Arabian Lower Palaeolithic. 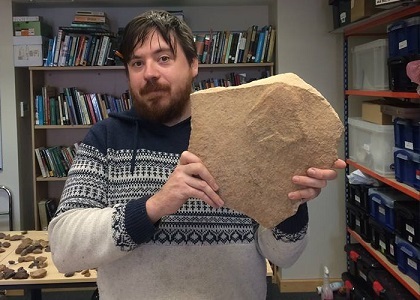 On the right is a 2D image of a handaxe found in the Nefud desert by the Palaeodeserts team in 2015. 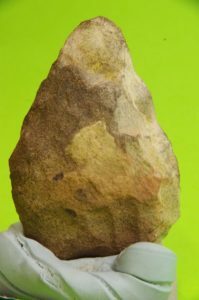 The 3D model below of the same handaxe is constructed from a series of 2D photographic images and allows us to analyse shape differences in such handaxes in much greater detail, using geometric morphometric techniques. 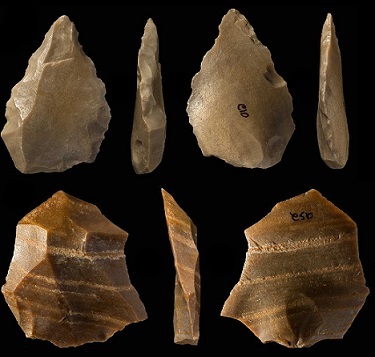 Palaeodeserts team members from the Universities of Oxford and Cambridge, along with other collaborators, are currently analysing early stone tools and their landscape settings from the Dawadmi area of central Saudi Arabia. Recent fieldwork identified a huge number of sites dating to the Acheulean (Lower Palaeolithic). These include the only excavated site for this period in Arabia, for which we are currently finalising the age results using optically stimulated luminescence dating. These are fascinating archaeological sites where early humans produced extremely large flakes (see picture), which were then shaped into handaxes that could be used for a variety of tasks. The density of Acheulean sites in this part of Saudi Arabia makes it one of the most important areas anywhere in the world for understanding this period. How did Homo sapiens expand out of Africa into Eurasia? Current fossil, genetic, and archaeological data indicate that Homo sapiens originated in Africa in the late Middle Pleistocene. By the end of the Late Pleistocene, our species was distributed across every continent except Antarctica, setting the foundations for the subsequent demographic and cultural changes of the Holocene. The intervening processes remain intensely debated and a key theme in hominin evolutionary studies. In this paper we review archaeological, fossil, environmental, and genetic data to evaluate the current state of knowledge on the dispersal of Homo sapiens out of Africa. The emerging picture of the dispersal process suggests dynamic behavioral variability, complex interactions between populations, and an intricate genetic and cultural legacy. This evolutionary and historical complexity challenges simple narratives and suggests that hybrid models and the testing of explicit hypotheses are required to understand the expansion of Homo sapiens into Eurasia. Read more in Rethinking the Dispersal of Homo sapiens out of Africa in Evolutionary Anthropology. In January 2016, colleagues from the Palaeodeserts project and Saudi Geological Survey (SGS) performed a collaborative aerial survey of locations across the western Nefud. 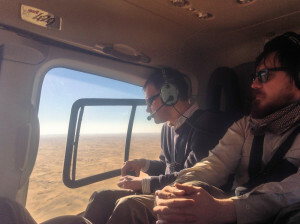 The use of the SGS helicopter allowed the team to examine numerous new locations deep in the Nefud, where major lake sediment outcrops testify to much wetter episodes in the past of this arid area. 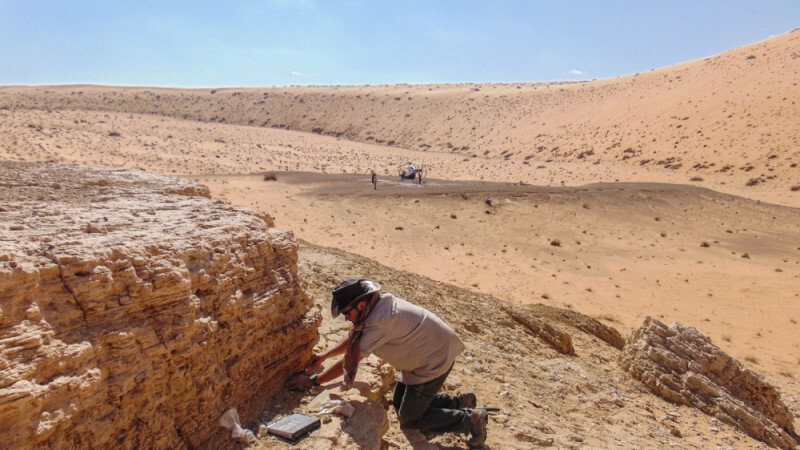 In combination with the analysis of satellite datasets, the results of these collaborative expeditions are revealing the overall distribution of surviving lake sediments, fossils and archaeology across the whole western Nefud, including areas away from the accessible desert fringes. By using these data, and dating the lake sediments and archaeology and fossils that highlight their former exploitation by prehistoric populations and animals, the team is gradually forming a picture of how the environments and occupation of this area of the Nefud have changed over prehistory. 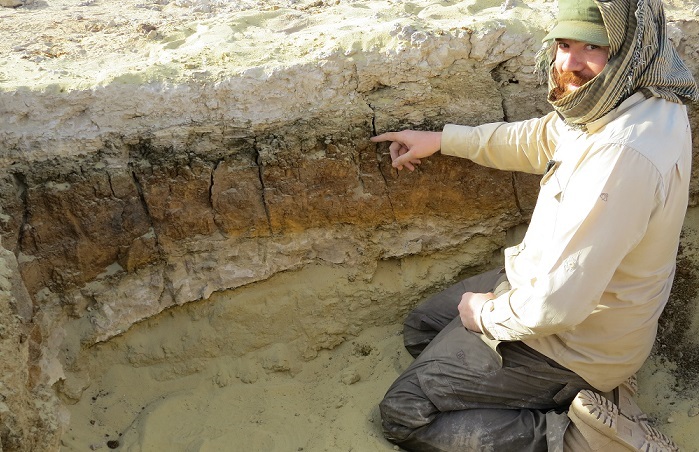 Palaeodeserts team member Huw Groucutt (University of Oxford) is running a symposium at the Society for American Archaeology conference in Orlando, Florida on April 7th 2016. The title of the session is “Parting the Red Sea: Late Pleistocene Human Dispersals and Lithic Variability in the Horn of Africa and Arabia”. The meeting is co-organised with Steven Brandt (University of Florida) and Yonatan Sahle (University of California, Berkeley). As well as a presentation by Huw Groucutt, Palaeodeserts is represented by Michael Petraglia, who is a discussant for the session. A workshop is being held at the University of Florida in the days before the conference to allow extended discussions on the topics. The workshop and conference symposium will allow us to present our exciting new findings from Arabia, and discuss the wider significance of these with colleagues working in surrounding regions. 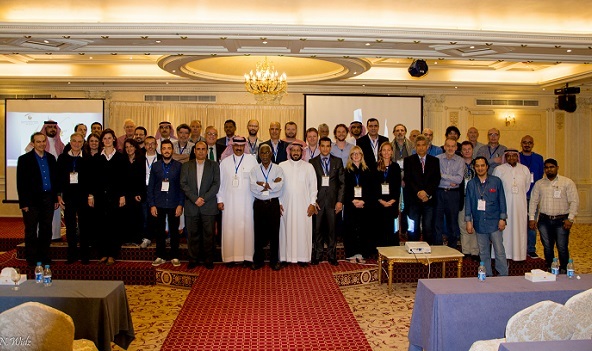 Michael Petraglia gave a talk entitled “Green Arabia, Blue Arabia: Examining Human Colonisation and Dispersal Models”, at the 2nd Jeddah International Workshop on the Geological Setting, Oceanography and Environment of the Red Sea, organised by the Saudi Geological Survey. Petraglia presented research on coastal versus interior zone models, situating archaeological sites into an over-arching framework to better understand the human population history of the Arabian Peninsula. Springer Press will publish papers from this interdisciplinary conference. Our study of the engraved rock art recorded on 254 panels in Shuwaymis, Ha’il Province, has shed more light on the Neolithic transition from hunting and gathering to economies utilising domesticated livestock in this part of the Arabian Peninsula. In particular, the re-use of hunting panels to create herding scenes, the re-engraving of hunting figures into herders, and the re-carving of hunting dogs into pastoral scenes all suggest that the engravers of herding panels still identified with the depicted hunters. 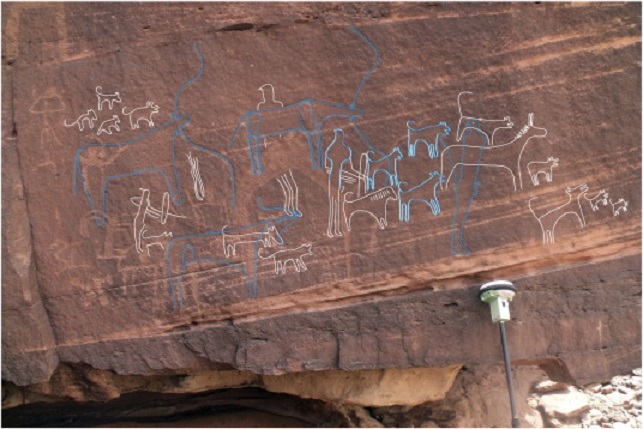 Read more in Hunters and herders: Exploring the Neolithic transition in the rock art of Shuwaymis, Saudi Arabia. 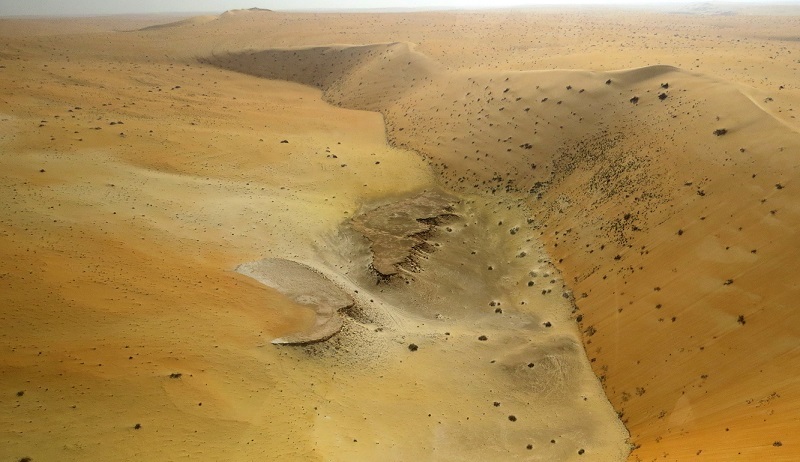 Recent excavations by the Palaeodeserts team in the Arabian Empty Quarter, the largest sandy desert in the world, have provided the first evidence of human occupation going back more than 80,000 years. Using a range of luminescence dating techniques, the Middle Palaeolithic artefacts recovered from the stratified sediments at the site of Mundafan Al-Buhayrah, have been dated to between 100,000 and 80,000 years old. The discovery of securely-dated archaeological material in the Empty Quarter, including stone tools, has important implications for hypotheses concerning the timing and routes of the dispersal of Homo sapiens out of Africa into Eurasia. Read more in Human occupation of the Arabian Empty Quarter during MIS 5: evidence from Mundafan Al-Buhayrah, Saudi Arabia. 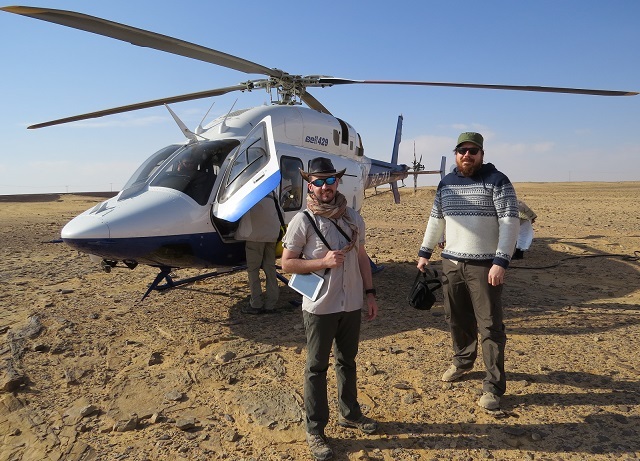 Collaboration between the Palaeodeserts Project and the Saudi Geological Survey (SGS) continued on the field trip to the Nefud desert of northern Saudi Arabia in January 2016, with SGS kindly offering the use of their helicopter to survey some of the remotest parts of the Nefud. Access to parts of the desert which can only easily be reached by air gave us unprecedented access to palaeolakes (ancient lakes) deep in the desert, which were magnets for animals and early humans. We are employing a variety of scientific techniques to date these lake sediments and are examining the archaeology and fossils that highlight the former exploitation of the lakes by prehistoric populations and animals. 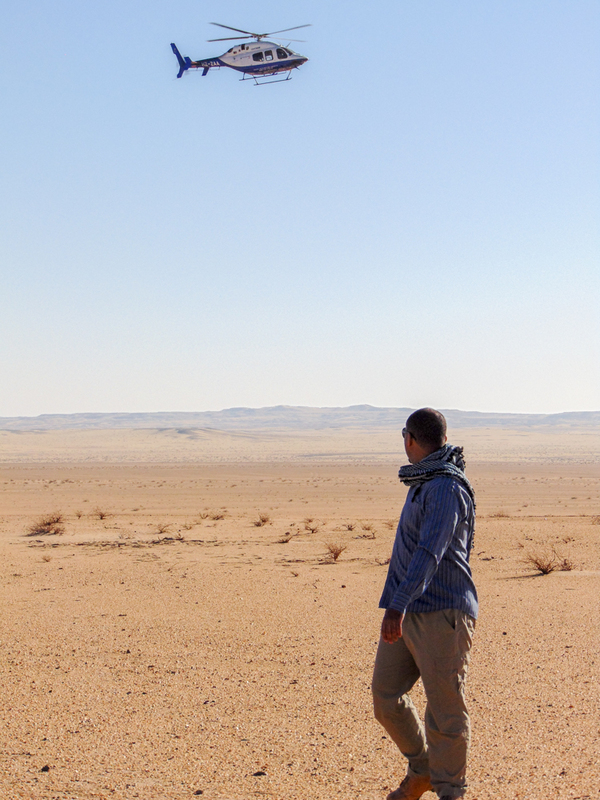 Analysis of these remote sites will provide important new information on climate change, the variety of ancient animals living in Arabia, how the environments and occupation of the Nefud have changed over prehistory, and the movement of early humans out of Africa.